The decentralized sports investment ecosystem has been getting a lot of positive press lately and the successful launch of their beta release is just one more reason why people are talking. The beta release of SportyCo allows talented prospective athletes to receive donations from fans and supporters. When the actual release version launches later this month, however, investors will be able to financially support promising athletes in exchange for a percentage of their future earnings. The launch of SportyCo’s beta release comes less than three months after the conclusion of an extremely successful token crowdsale. During the crowdsale, more than $5 million was raised and all told, more than 70 million SPF tokens were distributed to crowdsale participants, ambassadors, and the SportyCo team. It should be noted that the team’s tokens are vested (locked) for a period of one year. SportyCo is excited to have garnered the support of several prominent professional athletes, including football superstars Ronaldinho and Roberto Carlos, former NBA center and Cleveland Cavaliers scout Primož Brezec, and world champion ski jumper Noriaki Kasai. The platform counts among its advisors such notable members of the cryptocurrency community as Charlie Shrem, Phillip Nun, and Robby Schwertner, among others. Diego Silvio Franzot is a 17-year old football player from Italy who is currently studying and playing at the IMG Academy in Bradenton, Florida. Diego has played for Alaska FC in the Phillippines, Rumukuroshe Shell FC in Nigeria, the Desert Rangers in Dubai, UAE, and Alboraya UD in Valencia, Spain, where he competed in the U16 Liga Preferente. Gasper Kemperle is 17-year old Alpine skier from Slovenia. Gasper has placed 3rd or better in more than 8 championship skiing competitions, including 1st place in the Slalom and 2nd place in the Giant Slalom at the 2015 Regional Championship, 2nd place in the Giant Slalom at the 2015 Slovenian Championship, 1st place in the Giant Slalom at the 2016 Regional Championship, and 3rd place in the Giant Slalom at the 2018 FIS U18 Championships. Jaka Gorjan is SportyCo’s youngest athlete to date. Originally from Slovenia, the 11-year old is a rising talent in motorcycle racing, racking up an impressive seven 1st place wins at championship races throughout Slovenia and Italy. These three remarkable young athletes will be joined by others during the beta testing period. The final release of the platform later this month will, of course, be open to all prospective athletes. The investment module, which will also be released this month, will give sports fans and investors the ability not only to support burgeoning athletic talent through donations, but also to invest in promising athletes over a longer term using the platform’s smart contract functionality. SportyCo firmly believes that every promising athlete deserves the opportunity to pursue their dream of a professional sports career. To that end. SportyCo aims to open up the $1.3 trillion sports industry to small investors, democratizing sports investing and opening a new chapter in the sports industry. 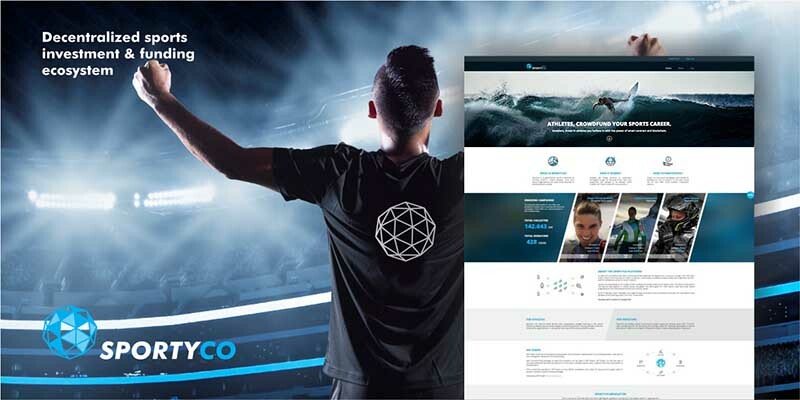 For more information about SportyCo platform, please visit sportyco.io or try out the platform’s beta release at sportyco.net. You can also stay up to date with the latest happenings by joining the SportyCo team’s Telegram chat channel. Have you tested the beta release of the SportyCo platform? What are your thoughts? How do you feel about individuals investing in up and coming athleteic talent? Let us know in the comments below.